As if rafting the Kaweah River weren't enough, after a day of paddling rafters can enjoy a visit to nearby Sequoia National Park. Sequoia National Park sits on the western flank of the Sierra Nevada range and shares many border miles with Kings Canyon National Park. Together these parks spawn three major California white water rafting rivers: the Kern, Kings and Kaweah Rivers. 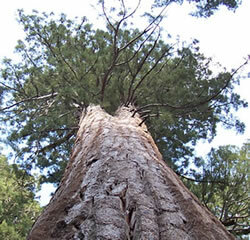 Sequoia National Park is home to forty giant sequoia groves--that's one-third of all naturally-growing sequoias. The tallest tree in the United States (the General Sherman tree) grows in the Lodgepole area of Sequoia National Park--this area is the closest to the Kaweah River. Just a short half-hour drive upstream from the Kaweah put-in, Lodgepole is home to both Alta Peak and Morro Rock. A set of stairs makes it easy to scramble to the top of Morro Rock, while the hike up to the top of Alta Peak at 11,000 feet is more taxing. But the reward for making the trek is huge-- on a clear day, you can see Mt. Whitney, the highest mountain in the contiguous United States. Avid backpackers will find many excellent hiking opportunities in the park. Permits are required for overnight camping outside of the designated campgrounds, but permits are free. Permits are not required for day hiking, except for those visiting the Mt. Whitney area.